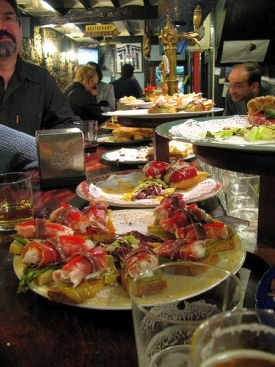 What Time Do The Basques Eat Dinner? Trick question. The answer is that it depends. Are you in Spanish or French Basque country? What’s the difference? To find out, the NYT takes a road trip through both countries, starting from the westernmost part of the region in the beach town of Bakio — about an hour north of Bilbao — where it’s easy for one to forget they’re even in Spain, then across the border into France to St.-Jean-de-Luz and nearby Bidart, where the Basqueness is hidden beneath a veneer of definite French culture, and where it takes a little gastronomical research to uncover the region’s history (shops selling Basque favorites fromage de brebis and cherry marmalades).